Walden (first published as Walden; or, Life in the Woods) is an American book written by noted transcendentalist Henry David Thoreau. The work is part personal declaration of independence, social experiment, voyage of spiritual discovery, satire, and manual for self-reliance. 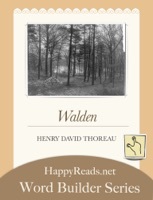 Published in 1854, it details Thoreau's experiences over the course of two years in a cabin he built near Walden Pond, amidst woodland owned by his friend and mentor Ralph Waldo Emerson, near Concord, Massachusetts. This e-book contains word builder games which provides a completely new way to learn English vocabulary Fast and Fun! Start reading the original book and playing with the interactive word building games to master the vocabulary listed in this book. The vocabulary words you’ll find in this book are most frequently used words.